A set of conformationally restricted analogues of the natural product primin were synthesized as potential antiprotozoal agents. The synthesis utilizes quinone C-H functionalization methods to enable an efficient and easy access to primin analogues. The antiprotozoal activities of this series were evaluated in a panel of parasites and compared with the natural product primin. 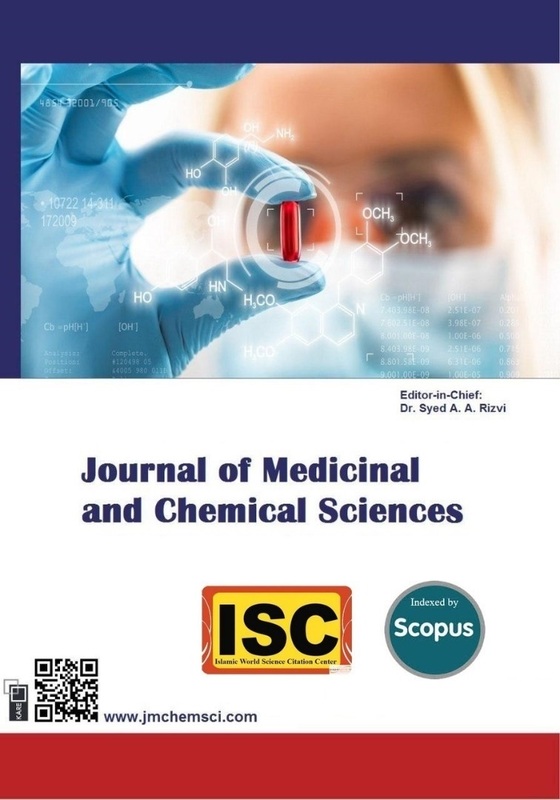 For all synthesized primin analogues a potent in vitro activity was found against the pathogen Trypanosoma brucei rhodesiense (IC50 < 0.05 µg/mL). The observed antiprotozoal activity is not related to production of reactive oxygen species (ROS). Initial results of the in vivo experiments with a T. b. rhodesiense rodent animal model of the human disease were also reported. Intraperitoneal injection administration of compound 7 resulted in complete clearance of T. b. rhodesiense in tested rodent animals 24 hours after the last treatment. 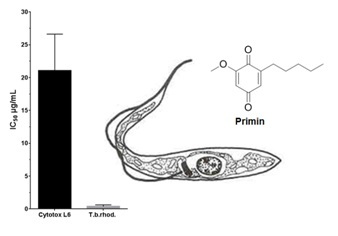 Our results show that the primin scaffold represents a new scaffold for further development of potent inhibitors of Trypanosoma brucei rhodesiense. H. Schildknecht, I. Bayer, Schmidt Zeitschrift für Naturforsch. Part B-Chemie Biochem. Biophys. Biol. und verwandten Gebieten1967, B22 (1), 36. G.Guella, I. Mancini, F. Pietra, Helv. Chim. Acta1987, 70 (3), 621. P. Moosophon, S. Kanokmedhakul, K. Kanokmedhakul, J. Nat. Prod.2011, 74 (10), 2216. Y. Hong, S. Sengupta, W. Hur, T. Sim,J. Med. Chem.2015, 58 (9), 3739. I.-K. Lee, B.-S. Yun, S.-M. Cho, W.-G. Kim, J.P. Kim, I.-J. Ryoo, H. Koshino, I.D. Yoo, J. Nat. Prod.1996, 59 (11), 1090. A. A. L. Gunatilaka, J. M. Berger, R. Evans, J. S. Miller, J. H. Wisse, K. M. Neddermann, I. Bursuker, D. G. I. Kingston, J. Nat. Prod.2001, 64 (1), 2. D. Tasdemir, R. Brun, V. Yardley, S. G. Franzblau, P. Rüedi, Chem. Biodivers.2006, 3 (11), 1230. M.S. Butler, Nat. Prod. Rep.2005, 22 (2), 162. D. J. Newman, G. M. Cragg, J. Nat. Prod.2016, 79 (3), 629. Y. Hata,M. Raith, S. Ebrahimi, S. Zimmermann, T. Mokoka, D. Naidoo, G. Fouche, V. Maharaj, M. Kaiser, R. Brun, et al. Planta Med.2013, 79 (06), 492. A. Bhattacharya, T. Kaur, K. Ganesh, Synthesis (Stuttg).2010, 2010 (07), 1141. A. Gunatilaka, J. Berger, R. Evans, J. Miller, J. Wisse, K. Neddermann, I. Bursuker, D. Kingston,J. Nat. Prod.2001, 64 (1), 2. L. W. Bieber, A. de Andrade Chiappeta, M. A. de Moraes e Souza, M. Generino, P. R. Neto, J. Nat. Prod.1990, 53 (3), 706. H. Nasiri, J. Ferner, C. Tukek, S. Krishnathas, H. Schwalbe,Tetrahedron Lett.2015, 56 (17), 2231. J. M. Saa, J. Morey, C. Rubido, C. J. Org. Chem.1986, 51 (23), 4471. T. T. Wager, X. Hou, P. R. Verhoest, A. Villalobos, ACS Chem. Neurosci.2010, 1 (6), 435. F. Fonseca-Silva, J. D. F. Inacio, M. M. Canto-Cavalheiro, E. E. Almeida-Amaral, J. Nat. Prod.2013, 76 (8), 1505. F. Fonseca-Silva, M. M. Canto-Cavalheiro, R. F. S. Menna-Barreto, E. E. Almeida-Amaral, J. Nat. Prod.2015, 78 (4), 880. J. B. Baell, J. Nat. Prod.2016, 79 (3), 616. H. R. Nasiri, P. Mracek, S. K. Grimm, J. Gastaldello, A. Kolodzik, D. Ullmann, Medchemcomm2017, 8 (6), 1220. H. Nasiri, K. Hohmann, M. Hatemler, A. Plodek, F. Bracher, H. Schwalbe, Med. Chem. Res.2017, 26 (6), 1170. Biological assaysIn vitro activity. The in vitro activity of the compounds were determinded against T.b.rhodesiense (bloodstream trypomastigotes, STIB 900 strain), T.cruzi (amastigotes, Tulahuen C4 strain), L.donovani (axenic grown amastigotes, MHOM-ET-67/L82 strain), P. falciparum (intra-erythrocytic forms, NF54 strain), and cytotoxicity against mammalian cells (L6 cells, rat-skeletal myoblasts) as previously described.24 In vivo efficacy studies: In vivo experiments were performed in T.b. rhodesiense (STIB900) infected mice as previously described.25 In vivo efficacy studies in mice were conducted according to the rules and regulations for the protection of animal rights (“Tierschutzverordnung”) of the Swiss “Bundesamt für Veterinärwesen”. They were approved by the veterinary office of Canton Basel-Stadt, Switzerland. Y. Fujiwara, V. Domingo, I. B. Seiple, R. Gianatassio, M. Del Bel, P.S. Baran, J.Am.Chem.Soc.2011, 133, 3292. I. Orhan, B. Şener, M. Kaiser, R. Brun, D. Tasdemir, Mar. Drugs2010, 8 (1), 47. M. Kaiser, M.A. Bray, M. Cal, B. Bourdin Trunz, E. Torreele, R. Brun, Antimicrob. Agents Chemother. 2011, 55 (12), 5602.